Abcam’s Resistin (RETN) in vitro SimpleStep ELISA® (Enzyme-Linked Immunosorbent Assay) kit is designed for the quantitative measurement of Resistin protein in mouse serum, plasma, cell culture supernatants, cell and tissue extracts. The SimpleStep ELISA® employs an affinity tag labeled capture antibody and a reporter conjugated detector antibody which immunocapture the sample analyte in solution. This entire complex (capture antibody/analyte/detector antibody) is in turn immobilized via immunoaffinity of an anti-tag antibody coating the well. To perform the assay, samples or standards are added to the wells, followed by the antibody mix. After incubation, the wells are washed to remove unbound material. TMB substrate is added and during incubation is catalyzed by HRP, generating blue coloration. This reaction is then stopped by addition of Stop Solution completing any color change from blue to yellow. Signal is generated proportionally to the amount of bound analyte and the intensity is measured at 450 nm. Optionally, instead of the endpoint reading, development of TMB can be recorded kinetically at 600 nm. Samples diluted in Sample Diluent NS: 6.5 pg/mL. Samples diluted in 1X Cell Extraction Buffer PTR: 27.4 pg/mL. Mouse Resistin (RETN), also described as ADSF (Adipose Tissue-Specific Secretory Factor) and FIZZ3 (Found in Inflammatory Zone), is a peptide hormone belonging to the class of cysteine-rich secreted proteins which is termed the RELM family. Mouse Resistin is a 114-amino acid (aa) peptide (with a 20 aa signal sequence and a 94 aa mature segment) containing 11 cysteines that allow the association of several Resistin monomers into macromolecular complexes. Mouse Resistin is 75% and 56% identical to rat and human Resistin, respectively. Hormone that seems to suppress insulin ability to stimulate glucose uptake into adipose cells. Potentially links obesity to diabetes. Expressed only in fatty tissues. Belongs to the resistin/FIZZ family. Our Abpromise guarantee covers the use of ab205574 in the following tested applications. Mouse Resistin standard curve comparison data. Standard curve comparison between mouse Resistin SimpleStep ELISA® kit and traditional ELISA kit from leading competitor. SimpleStep ELISA kit shows comparable sensitivity with shorter protocol time. Example of the mouse Resistin standard curve in Sample Diluent NS. 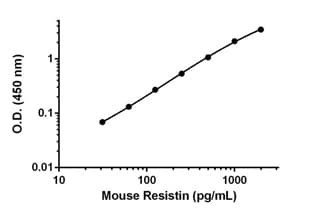 Example of the mouse Resistin standard curve in 1X Cell Extraction Buffer PTR. Linearity of dilution of mouse Resistin in serum and cell culture media. Native mouse Resistin was measured in 2.5% mouse serum diluted in a 2-fold dilution series in Sample Diluent NS. Recombinant mouse Resistin was spiked into 10% cell culture media and diluted in a 2-fold dilution series in Sample Diluent NS. 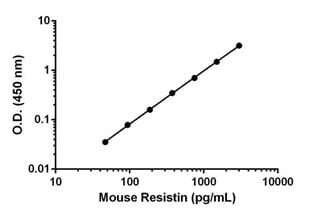 The concentrations of mouse Resistin were measured in duplicate and interpolated from the mouse Resistin standard curve and corrected for sample dilution. The interpolated dilution factor corrected values are graphed (mean +/- SD). Linearity of dilution of mouse Resistin in plasma samples. 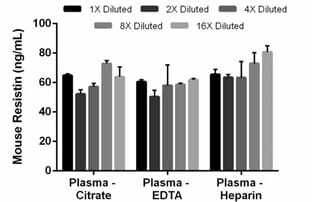 Native mouse Resistin was measured in 2.5% mouse plasma citrate, mouse plasma EDTA, and mouse plasma heparin samples diluted in a 2-fold dilution series in Sample Diluent NS. The concentrations of mouse Resistin were measured in duplicate and interpolated from the mouse Resistin standard curve and corrected for sample dilution. The interpolated dilution factor corrected values are graphed (mean +/- SD). 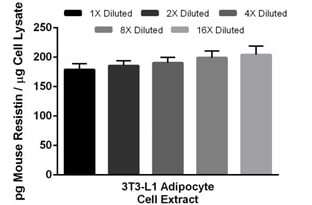 Linearity of mouse Resistin in 3T3-L1 adipocyte cell extract. Native mouse Resistin was measured in 10 μg/mL of 3T3-L1 adipocyte cell extract diluted in a 2-fold dilution series in 1X Cell Extraction Buffer PTR. The concentrations of mouse Resistin were measured in duplicate and interpolated from the mouse Resistin standard curve and corrected for sample dilution. The interpolated dilution factor corrected values are graphed (mean +/- SD). Assay specificity is demonstrated on 3T3-L1 cells. 3T3-L1 cells were cultured in the presence and absence 1 µM Dexamethasone, 0.5 mM IBMX, 1 µg/mL insulin for 10 days to generate adipocytes and undifferentiated cells respectively. At the end of the treatment, protein extraction was carried out according to section 11.4 of the booklet. Both 3T3-L1 adipocytes and undifferentiated cell extracts were measured in duplicate at 10 µg/mL using this kit. The Raw O.D. values for each sample are graphed, with the background O.D. shown as the dashed line. The 3T3-L1 adipocytes were measured at 179 pg of Resistin/µg of cell lysate, whereas the 3T3-L1 undifferentiated cells measured below the limit of detection for this assay. ab205574 has not yet been referenced specifically in any publications. Publishing research using ab205574? Please let us know so that we can cite the reference in this datasheet. There are currently no Customer reviews or Questions for ab205574.